Escalating Aggression in Syria. Trump’s Punitive Strike Prelude to Broader War? Was US-led terror-bombing of Syrian sites overnight Friday, based on a Big Lie, prelude to greater aggression coming – Israel involved along with Washington, Britain, France, and perhaps other rogue nations? Russia’s passivity in the face of escalated US-led aggression risks the worst ahead, including all-out war in Syria, likely spreading regionally and beyond, maybe going global, possible nuclear war. Iran is a prime target. Longtime US/Israeli strategy aims to replace its sovereign independence with pro-Western puppet governance – the key regional goal of both countries. On Saturday, an incident occurred at an alleged Iranian weapons depot in Mount Azzan near Aleppo. One or more explosions were reported by Western, Israeli and other regional media. Syrian media said the site was bombed by an Israeli warplane. Hezbollah-connected media denied it, saying an explosion occurred inside the depot or unrelated to an airstrike. Some sources reported around 20 dead or wounded – no confirmation from official sources about the incident, occurring 24 hours after US-led aggression, targeting multiple Syrian sites. Nor have separate reports of aerial attacks on Syrian government targets in Deir Ezzor been confirmed. Government forces are battling US-supported terrorists in the area. 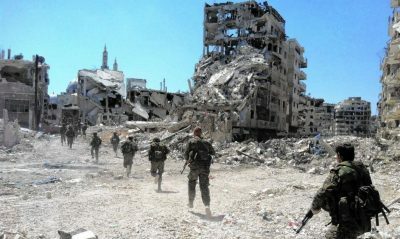 No evidence proves Syrian forces ever used them. Trained by Pentagon contractors in their use, US-supported terrorists resort to this terror tactic often. Another CW false flag like Douma is likely coming – probably followed by greater US-led aggression than occurred overnight Friday. Russian passivity risks making a bad situation far worse. Diplomacy as a way to contest US-led aggression is a failed strategy – shooting blanks against a ruthless adversary, willing to do whatever it takes to achieve its objectives no matter how many times before it failed. Endless US wars in multiple theaters prove this reality. Over seven years of war in Syria shows if Moscow doesn’t challenge Washington forcefully, it’ll likely continue endlessly, escalating toward something far more serious than already. A draft US/UK/French Security Council resolution reportedly demands Assad engage in peace talks “constructively and without preconditions” – diabolical code language suggesting escalated aggression coming even if the resolution isn’t adopted. Washington doesn’t negotiate. It demands, aiming for regime change since launching aggression in March 2011. Overnight US-led attacks on Syrian targets achieving nothing strategically may have been target practice for what’s to come. Something far more serious seems likely. Will Russia finally challenge Washington forcefully enough to show it no longer will tolerate its hostile actions? Or will it remain a passive bystander, relying on ineffective diplomacy, letting a bad situation likely get much worse? The stakes in Syria are huge. Failing to contest Washington’s imperial agenda in the country strongly beyond rhetoric practically assures escalated war to come.